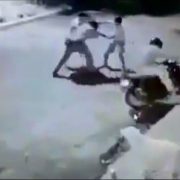 I think that this off-duty cop made a few errors for us to be aware of, but in the end it’s the muggers who lost the fight so that’s a win for good people! If you value what we do at ASP, would you consider becoming an ASP Patron Member to support the work it takes to make the narrated videos like this off duty cop doing enough to defeat these muggers? https://get-asp.com/patron gives the details and benefits. 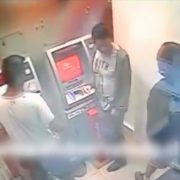 What does this video teach us about defending ourselves against muggers, especially at the ATM? Transitional spaces are places where we MUST be more careful of potential attack. A transitional space is any location that (1) allows attackers to prey on potential victims with an element of surprise and (2) provides ready escape for the attackers. Here they used the poor design of the ATM to ambush the off-duty cop. When you’re in a transitional space, make sure you are aware! 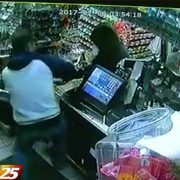 Most armed robbers are not the sharpest tools in the shed, and this alert clerk was able to take advantage of that! Would you have fought her for her rifle? If you value what we do at ASP, would you consider becoming an ASP Patron Member to support the work it takes to make the narrated videos like this armed robber losing her gun? https://get-asp.com/patron gives the details and benefits. Transitional spaces are places where we MUST be more careful of potential attack. A transitional space is any location that (1) allows attackers to prey on potential victims with an element of surprise and (2) provides ready escape for the attackers. The clerk had no notice of the armed robber because of the transitional space. Thankfully he was able to launch a counter-attack. One of the five pillars of lawful, moral self-defense is “imminence,” (get a nutshell here: http://get-asp.com/wbbp or the whole concept here: http://get-asp.com/1fqe ). Imminence means the threat is happening RIGHT NOW, that it’s neither too late nor too early for you to defend yourself! The standard of imminence is seen as a triad of ability, opportunity, and jeopardy (also known as the AOJ triad, which is explained here: http://get-asp.com/pm3k in some detail). 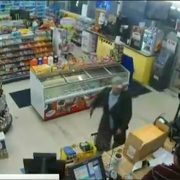 The clerk did a good job here of getting the firearm away and then recognizing the end of the imminent threat that the armed robber posed. Armed robbers think they have a force advantage; when an armed patron takes that away, they run for the hills many times! 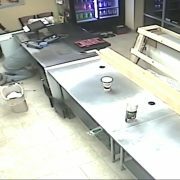 If you value what we do at ASP, would you consider becoming an ASP Patron Member to support the work it takes to make the narrated videos like these armed robbers getting overwhelmed by an armed patron? https://get-asp.com/patron gives the details and benefits. Sorry, folks, I have no details on this one other than that it was apparently in Mexico: https://get-asp.com/r37s so if you have any additional information, please send it to me so I can update this post. Keep your firearm on your person! Plenty of people keep a firearm stationed near them under the counter or on a desk, or in a purse or in the glove box of the car, but in the moment of need you can’t ever be sure that you can get to it if it’s not on your person. 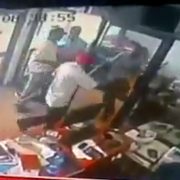 These armed robbers weren’t going to wait for the armed patron to get his gun out! Keep your firearm ready to fire. Some people carry their firearm with an empty chamber, but doing so is not recommended for several reasons. First, it assumes that you will have both hands available to you to draw your firearm, which isn’t necessarily the case. You might have a hand engaged or injured. Secondly, it assumes that you’ll have time to chamber a round in a gunfight, but gunfights are won and lost on tenths of seconds. Third, it assumes that you’ll have the dexterity to chamber a round under duress, though in the moment many times I have seen people fumble their chambering attempt. Fourth, the sound of a round chambering can alert an attacker who is not focused on you that you are a danger to him, which can negate your element of surprise in a counter-ambush. Keep your defensive firearm ready to fire, with a round in the chamber! 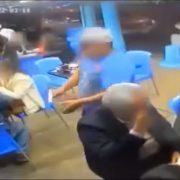 This armed patron needed to use his gun, not prepare it! Marksmanship matters! The old saying is quite true: you can’t miss fast enough to win a gunfight. As a self-defender you need to practice and train to put your first shot on target as fast as you can, but the key is to put as many shots on target as possible. Usually the first person to put shots on target wins the gunfight. (not always, but usually) So putting the first shot on target every time and quickly is imperative. 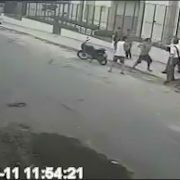 The armed patron got the first shot on target, and that was what made the difference against these armed robbers.